Technology has become easily adaptable in such a way that it touches every aspect of living and non-living segments in our daily life. Off late, We have been hearing about Smart-homes every now and then, but what exactly are smart homes? What experiences and technologies together constitute a smart home? Can we make our homes smart at any point in time? These are the basic questions any individual would have on hearing the terminology for the very first time. 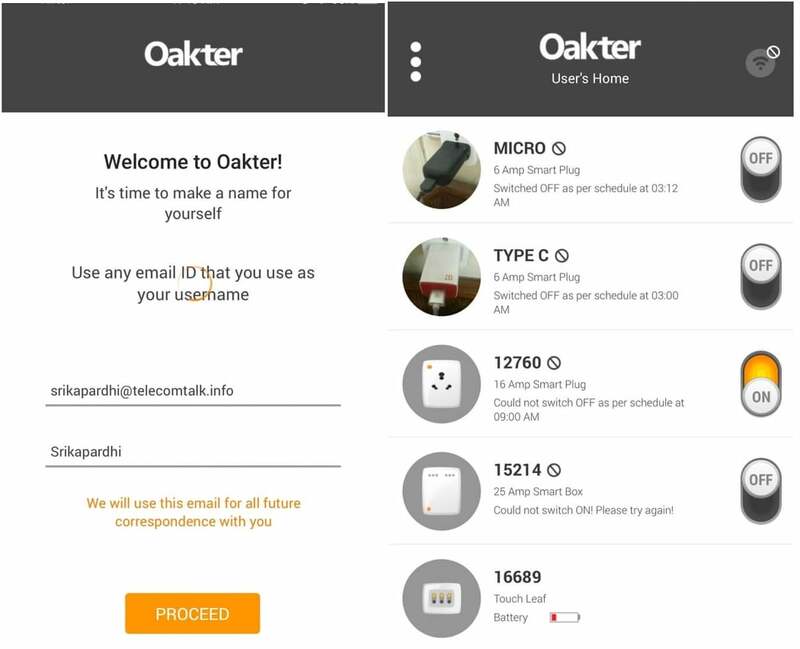 We have had our hands on experience with a ‘Smart home Kit’ by Oakter, one of India’s IoT startup companies and tried to bring out answers for common questions that any novice user will have on smart homes using this product as an example. I will also try to outline the product, technology and company’s objectives along with my perspective in a very lucid way. *What made your team to start this product? We made Solar AC, but that was not commercially feasible. 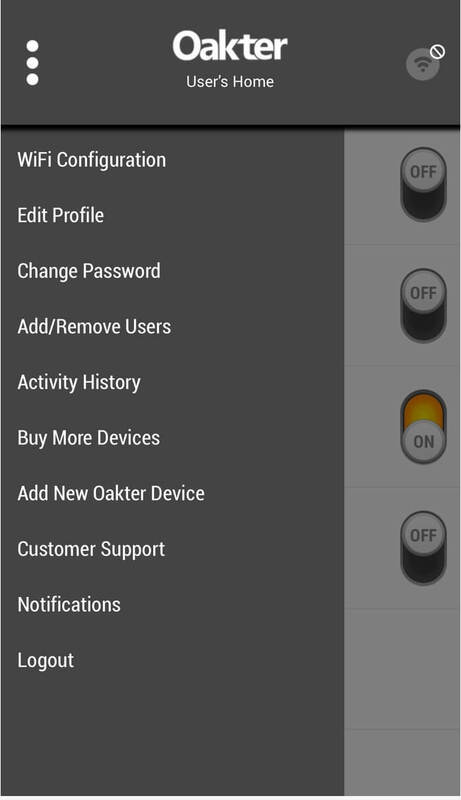 However the IoT controller we developed in that project to reduce the running cost of AC gave birth to Oakter. 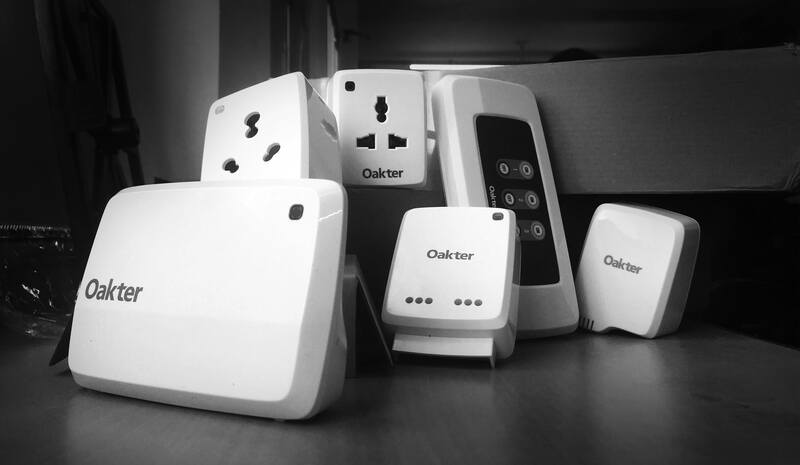 *How does Oakter define a smart-home? Any house automated with the help of hardware and controlled with software together when and where required is defined as a smart home. So, what is a smart home? In our perspective, in simple terms, it is an addition of more functionality and control of electronic appliances which give more options and comfort to consumers. *What is Oakter’s primary objective? To bring automation with the help of IoT and enable smarter functionalities for existing facilities in homes making them smart-homes. We have already discussed IoT in an article here. You can refer it for any clarifications and an example case of IoT usage is also highlighted. Now, let us understand this ‘Smart Home Kit‘ functionality in layman terms. Functionality Overview: Control electronic appliances connected to smart plugs wirelessly or via smartphone application using the internet from anywhere across the globe. 1.Leafs – These are smart plugs supporting various Amperes – 6, 16, 25 AMP for various capacity devices. These plugs wirelessly communicate with the Touch Leaf and The Hub for their control using RF. These Leafs can be controlled(On/Off) either with the Touch Leaf just like a wireless remote without the need of Hub or by the Hub using Smartphone application via the Internet. 2.The Hub – The hub is the heart of the system which comes into picture only when you need to control the smart plugs using smartphone application via the Internet. The Hub needs internet connectivity for it’s functioning which can be via Mobile Network or WiFi. One Hub can support up to 50 Oakter devices. 3.Touch Leaf – This acts like a wireless remote and works even if the Internet is not available or when Hub is switched off too. It requires 3AA batteries. This Touch leaf works within a range limited to RF functionality in general. What kind of devices can be connected and controlled using these smart plugs? Practically, existing home appliances like AC, geyser, water pump, lamp, heater, coffee machine, TV, mosquito repellent etc. that fits into these smart plugs can be used, but don’t forget to make sure to use those plugs which support AMP consumption of high powered devices. 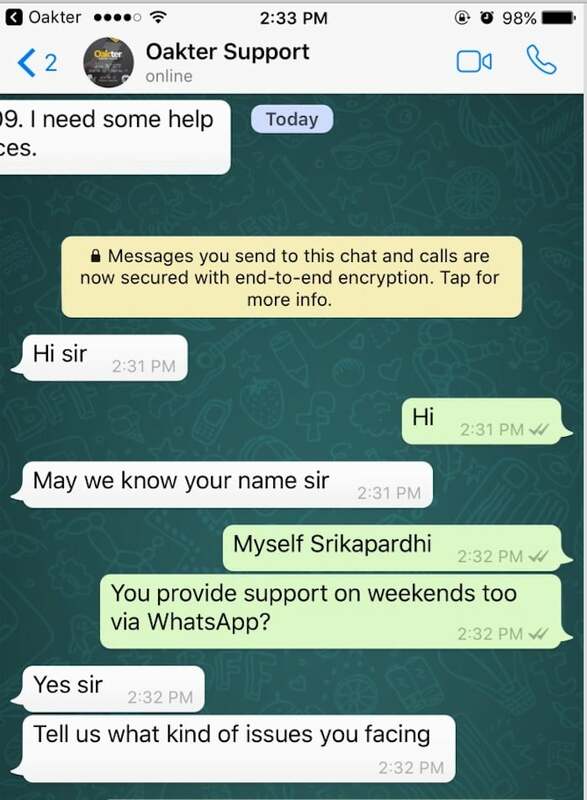 Oakter team provides product support via WhatsApp on weekends too. So, one can quickly get in touch with them via chat app itself and get any issues sorted out. *Who do you think can use your products? Our products are simple and easy to configure. So, users who have basic knowledge on using smartphones, and having access to the internet can use our products with ease. *Any more advancements in technology or integrations pipelined? Yes, we are working with Google on integrating our smart home products with Google Home. *Why the name Oakter – After all, in the end, everyone will be curious to know why the name ‘Oakter’. Isn’t it? Oak tree qualities + Technology Enabled Residences. So, our company is based on this vision. About Oakter: Oakter, a tech startup based out of Noida, was founded in 2014. Amazon has chosen Oakter, a Noida based tech startup, for its Launchpad platform in India. Oakter’s products are completely made in India and designed to solve the needs of Indian consumers. So, what are these smart home kits actually doing? These kits are imparting additional functionalities using sensors/wireless components/internet to the already existing devices so that they can be used in a smart way and be controlled via mobile applications from anywhere across the world. 1. These kits act like additional enhancements or add-ons to the existing functionalities. 2. So, technically a software application controls the appliances in home/office communicating via a medium called the internet. 3. Sensors give the feedback and together work with software to control the hardware on the internet medium. So, now anyone can schedule a geyser to be switched on/off at particular times, switch on the AC in the home while still on the way to home. Basically, it’s like giving instructions to these devices too which are listening for commands on the internet. These kind of kits help users to add smartness to existing appliances in homes making them smart. All that is discussed above is just a beginning of the smart homes, more integrations and functionalities are yet to be developed and experienced. So to conclude in a way, ‘Internet’ is the core of the communication medium and the quality delivered by these IoT products is also dependent on the quality of the Internet. Dear readers do share your thoughts or experiences with smart home products or on IoT via comments or tweet me @Srikapardhi. Note: For * marked questions, replies are from team Oakter. More information about Oakter products can be found on their website.The performance delivered using smartphone application and acknowledgment from Hub are dependent on the stability of the internet connection as well. Is the Vodafone’s new high-end RED Postpaid plans enough to appeal the consumers?